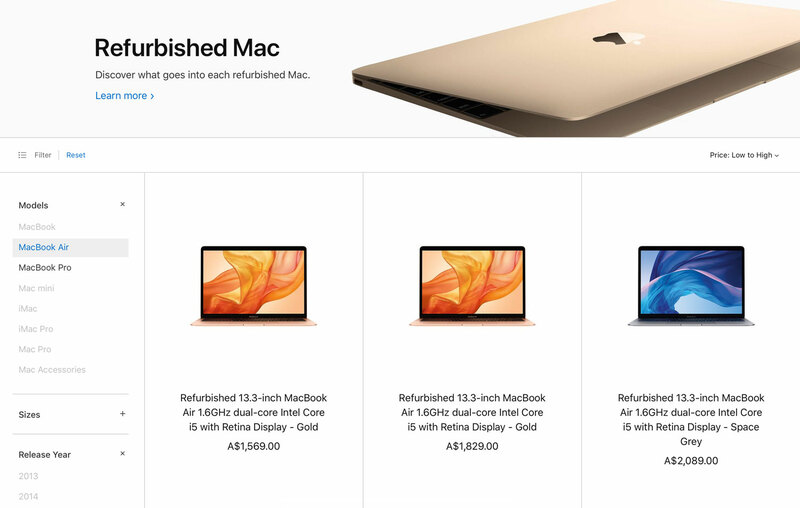 For the first time, 2018-released MacBook Air models are now available on Apple’s Australian Certified Refurbished online store. With discounts of up to A$320 off the recommended retail price. The 2018-released MacBook Air is still, at the time of writing, the current generation. It features a new Retina display, Touch ID, latest-generation keyboard, and a Force Touch trackpad. It is also the first Mac created from 100% recycled aluminium, making it the greenest Mac ever. The fact it is still the current generation makes the refurbished deal even better. All Certified Refurbished products are sold by Apple and have all gone through a ‘rigorous refurbishment process’. This process includes Apple testing and inspecting every model and repackaging it with cables and manuals. The result is a saving of up to 15% less than when new. But if you are a little unsure, Apple’s free returns policy does expand to refurbished products. Apple has priced the entry-level refurbished MacBook Air with 128GB of SSD storage at A$1,569 – a saving of A$280. The upgraded MacBook Air with 256GB of SSD storage is discounted by a massive A$320. Bringing the price to A$1,829 from A$2,149. All certified refurbished products, including the MacBook Air, is only available from Apple’s online store. All purchases include free fast delivery around Australia, but most importantly, 14-day returns. Should you not be happy with the purchase, Apple will allow you to return it free. What about the durability of refurbished MacBook Air? Thinking to buy one, can I trust them?